Tractor, Harvester Of John Deere, New Holland, Case, Ford, Etc. 101S series orbital steering valve is with relief valve ,suction valve, inlet check valve intergrated,and different valve can be assembled freely, compact, more convenient, fitting for European and American standards. Widely applied to low speed and heavy vehicles , construction machinery, tractor, forklift, digger, loader, helm control. Replace popular models of Danfoss, Eaton, M+S, Caproni, Rexroth, and OEM parts of John Deere, Ford, Massey Furguson, New Holland, MTZ, etc. 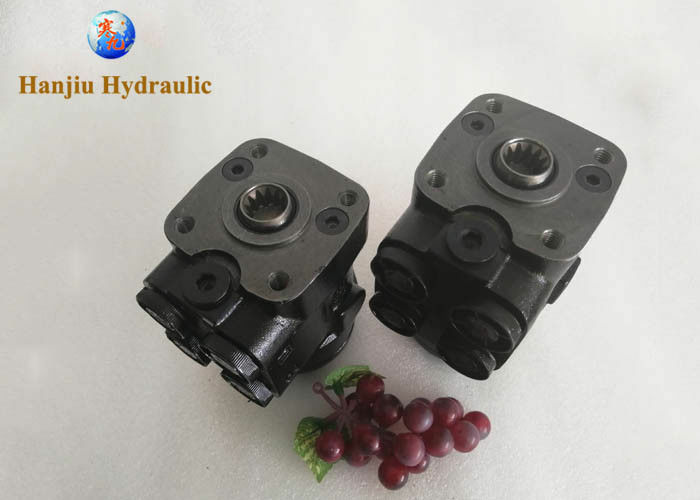 101S series hydraulic control unit 's shape ,internal structure ,performance are same as Danfoss OSPC**ON, M+S HKUS***/4 , Eaton 401-1***, Sinjin N/Y***E.
All of Hanjiu's orbital steering valves have a built in return-to-center function. This means that when the driver releases the wheel the tires will automatically return to the center position. This is a convenient feature that allows for slow rock crawling or driving at higher speeds. The amount of turns it takes to get from lock to lock will depend on what ram you combine with your orbital. We have included a chart that will tell you exactly how many turns it will take to get from lock to lock with the different orbital/ram combinations, with the recommended combinations in boldletters. Please do not hesitate to contact us for further information, inquiries or orders. Thank you for choosing 'Hanjiu' Hydraulics.